If Maxwell Arnal had his choice, most of his days would be spent in a garage. A 17-year-old from Cherry Hill with a passion for working on cars, Arnal is one of those kids who has a hard time sitting still inside a classroom. That’s why his junior year at Cherry Hill West did not include pop quizzes, SAT preparation or any serious thought about academics. In fact, he hardly even showed up at all. “I went for one or two days just to keep my name in the books, but I really wasn’t going to school,” he admits. “I was working with my friends on other people’s bikes, I was working on cars. Generally just doing handyman-type stuff. “Here” is the New Jersey Youth Challenge Academy, and it has been giving students like Arnal a second chance at a quality education since being established in 1993. Sponsored by the National Guard and the state of New Jersey, the program is tuition-free and open to students between 16 and 18 who have dropped out voluntarily or failed out of high school. “The candidates are students who have found that traditional schools are just not working out and need an alternative to get a second chance at their diploma,” says Stephanie Dearden, the assistant coordinator for recruitment, placement and mentoring at the academy. Count Arnal among that group. Although he had misgivings upon entering the academy in April, he is proud of himself for sticking it out and is on track to graduate in September. Located at Joint Base McGuire-Dix-Lakehurst, the academy stresses academic improvement with a focus on math, science, social studies and language arts. Cadets who make it through the program earn the opportunity to take the GED exam and receive a New Jersey state high school diploma if they pass. But schoolwork is just one of the eight core components, which also include life coping skills, job skills, health/hygiene, responsible citizenship, service to the community, leadership/fellowship and physical fitness. The academy is a significant adjustment for almost everyone who joins. Since it is based on military principles, discipline and structure play an important role, and the first two weeks of the program are referred to as the acclimation phase so students can adapt to their new circumstances. Their only communication with friends and family at this stage is through written letters. Dearden calls the acclimation phase “the hardest part of our program” and “a culture shock” for the students. Some drop out during this period, either by their own choice or because they are causing problems and are asked to leave. Students like Robbins who persevere through the acclimation phase become cadets and move on to the residential phase, which lasts for 5 ½ months. 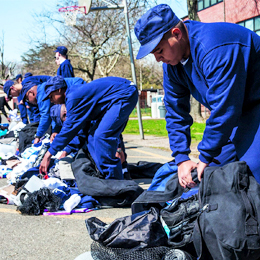 Their days— which start at 5 a.m. and end at 9 p.m.— are filled with chores, classes, marching formations and physical training. They sleep in barracks with about 20 people per room, with females and males on separate floors. The residence also has two computer labs, a library and spaces where students can relax, do homework or watch movies. During the residential phase, students are permitted one five-minute phone call per week to catch up with their parents or other family members. Their only in-person visits are from their designated mentors; a responsible adult they choose who lives outside of their household. Pendleton’s father is in the military so he moved often while growing up and attended several schools. He has found stability at the academy and built friendships with his fellow cadets. “There’s a lot of similarities between us,” he says. “Everybody is here to get a diploma or get their parents’ trust back. This was the last choice for a lot of the people here. Pendleton and the other cadets who complete the residential phase move on to the post-residential phase, in which they meet regularly with their mentors and academy leaders to follow through on their goals. Some decide to continue with their education and enroll in college, others enter the working world and a large number join the military after getting a taste of the commitment. Robbins is also considering joining the Army when she graduates. No matter what she decides, the girl who dropped out of high school because she didn’t like being around other people has made a dramatic change. The academy is currently accepting applications for its next class, which starts on Oct. 9. Arnal encourages anyone who may be struggling to look into the program, because it helped him get back on track.